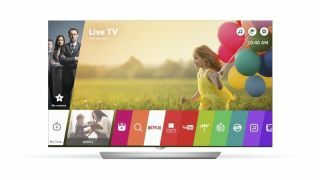 LG has announced it will showcase the latest version of its webOS smart TV platform at the biggest consumer tech show of the New Year. webOS 3.0 will make its grand entrance at CES 2016, housed inside LG's smart TV lineup for the year. The platform is being treated to a number of upgrades and new features, many designed to better integrate the various streaming and TV viewing options today's content consumers have grown accustomed to accessing. Plus, there's a lot more free content on the way, too. The first three notable additions are Magic Zoom, Magic Mobile Connection and an improved Magic Remote. Magic Zoom gives users a closer look at stuff on their screen without messing with image quality, LG claims. We take this to mean that blowing up an actor's face won't turn it into a blurry pixel puddle. Magic Mobile Connection essentially lets users connect their phone to their TV and then see their apps on the silver screen. For its part, Magic Remote now has dedicated power and menu buttons for set-top boxes and will also run your DVR. Its digital doppleganger is also getting a makeover so it's simpler and easier to use. Ever looking to streamline the smart TV experience while offering more, webOS is sticking to its lean style and at the same time building out its offerings. A partnership with Xumo, a connected TV technology platform, has borne Channel Plus, which will deliver "an abundance of high quality, free digital content" from a number of sources, including Buzzfeed, Time, Bloomberg Politics, The Wall Street Journal, PopSugar and more. It's an over-the-top solution that looks to bring more than YouTube videos to your TV screen. There's also a new Channel Advisor feature that basically takes note of what users like to watch and when their favorite programs air, then displays times and program information for those shows. Multi-view lets webOS TV owners watch content from two different places at the same time, whether that's two different channels or a TV station and Blu-ray movie viewed simultaneously. Why you'd want to do this beats us, but it's a neat party trick. A Music Player app will play tunes through your TV speakers even while the is turned off, and an IoTV app (like Internet of Things, get it?) lets users control their smart home appliances via apps displayed on the screen. Finally, a My Channels and Live Menus update brings more useful sub-features, including the power to register up to 10 favorite channels in the Electronic Program Guide and looking at what's playing on other favorite channels without leaving the screen currently in use. webOS 3.0 will be on display on LG TVs at the company's CES booth. The show officially kicks off January 6, with LG's press conference scheduled for January 5.